Check out the sunset on Sunday, January 27th at Light Gate location at the Manhattan Beach City Hall and the Library, along Highland Ave. 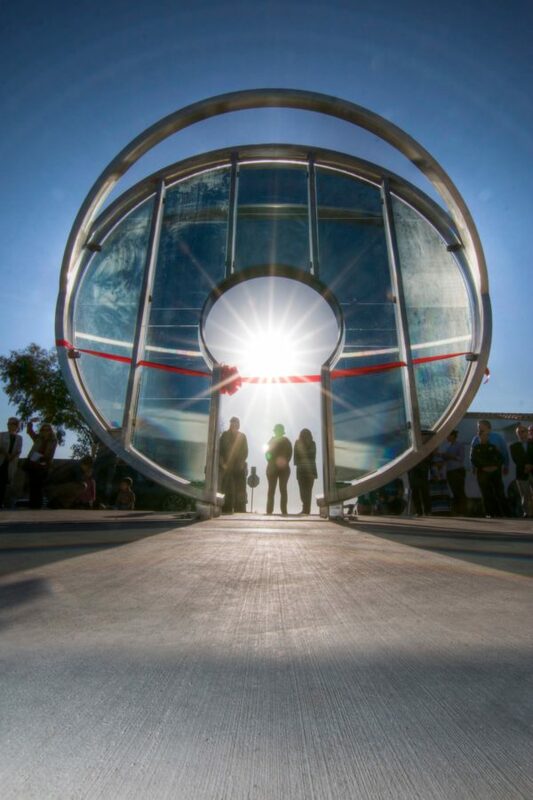 The sunset will align within the keyhole from 4:30 – 5 p.m. For more information about Light Gate visit citymb.info/departments/parks-and-recreation/cultural-arts/art-in-public-places/light-gate -centennial-art-project. Living life with Purpose, Balance and Joy. Cancer Support Community Redondo Beach (CSCRB) presents this eight week program beginning Thursday, Jan. 24. Based on Julia Cameron’s bestselling book “The Artist’s Way,” cancer survivor Karen Sidney will provide tools and insights to provide clarity for what is possible in a person’s life at this time. Participants will learn to reinvent themselves for the better, and experience less stress in their lives. 10:30 a.m. – 12:30 p.m. 109 W. Torrance Blvd., Redondo Beach. Advance registration required. Call (310) 376-3550 or visit cancersupportredondobeach.org. Mostly made of college students, the Young Adult Group is a social network for everyone ages 17 – 28. This group meets to discuss current events, to be supportive of each other and to plan upcoming events, such as fundraisers, movie nights and outings, with a supportive, fun, respectful environment that promotes the development of community, personal identity, pride and queer culture. 6 – 9 p.m. The Center is at 16610 Crenshaw Blvd., Torrance. (near El Camino College, across the street from a 7-Eleven store). For information call (310) 328-6550 or visit southbaylgbtcenter.org. Cancer Support Community Redondo Beach (CSCRB) will host Jeanne Peters RD, Nutrition Director of the Nourishing Wellness Medical Center. Brain fog and memory issues affect people of all ages, especially cancer patients suffering from “chemobrain.” Peters will discuss the many science based foods, lifestyle and supplements that can profoundly impact brain health and quality of life. 1 – 2:30 p.m. 109 West Torrance Blvd., Redondo Beach. A healthy lunch will be provided by “The Spot” Restaurant in Hermosa Beach from 12:30 – 1 p.m. Advance registration required. Call (310) 376-3550 or visit cancersupportredondobeach.org. Volunteer Trail Watch Training with the Palos Verdes Peninsula Land Conservancy. Like to hike, ride your bike or horse? Want to help protect the Preserve, its habitat and wildlife? Become a Trail Watch Volunteer and make a difference on the trails. 18 years and older. 9 a.m. – 1 p.m. Ladera Linda Community Center, 32201 Forrestal Drive, Rancho Palos Verdes. Sign up at pvplc.volunteerhub.com. For thousands of years original medicine and mind-body techniques have been used successfully worldwide to help obtain and sustain vibrant health. Explore the world of natural medicine techniques and discover natural health tools, tips and methods to help yourself heal at the Explore Natural Health Event. Free. 1 – 4 p.m. Anderson Senior Center, 3007 Vail Ave., Redondo Beach. Visit healthylife.net. The Palos Verdes Peninsula Land Conservancy presents an exciting selection of adventurous and inspirational films about nature, featuring beautiful cinematography and remarkable individuals. 4 p.m. Performing Arts Center, West High School, 20401 Victor St., Torrance. Tickets $10 in advance and $15 at the door. Purchase tickets at pvplc.org. Light Gate is located at the top of 14th Street, between Manhattan Beach City Hall and the library, along Highland Avenue. The artwork is made of glass, laminated with prismatic lighting film that will create rich and varied light effects with the sun. Light Gate will focus the view through an opening down 14th Street to the Ocean. The sunset will align within the keyhole. 4:30 – 5 p.m. For more information about the Light Gate call (310) 802-5448 or visit citymb.info/departments/parks-and-recreation/cultural-arts/art-in-public-places/light-gate-centennial-art-project. Jewish Women’s Theatre presents “Family Secrets,” a show involving secret stories of youthful indiscretions, missteps, dishonest acts and outright naughty activities that make for a moving, eye-opening, and funny show exploring events only whispered about, until now. 1:30 p.m. Congregation Tikvat Jacob, 1829 N. Sepulveda Blvd., Manhattan Beach. $45. For more information or to buy tickets visit ctjmb.org/jwt. Join the hunt for vintage treasure when over 200 sellers transform the streets of downtown Torrance into an eclectic open air antiques market. Antique appraisal booth $3 per item, DJ Ozzie in the park, Ed Gould and Stacy Robin in the Plaza, antique and specialty shops open, free admission and pet friendly. Restaurants, bakery, sports bars and tea room. 8 a.m. – 3 p.m. El Prado Avenue and Sartori Avenue, Old Torrance. For questions call (310) 328-6107 or visit torranceantiquefair.com. Rain or shine. Cancer Support Community Redondo Beach (CSCRB) hosts cancer survivor Veritta Smith, an international yoga and dance Instructor. Smith will instruct participants on how to incorporate a fun “Yoga on the Go” practice into a daily routine. Attendees will learn how to slip into a yoga pose while getting ready for work, sitting in traffic, waiting in the doctor’s office or just sitting in front of the TV. Advance registration required. 10:30 – 11:30 a.m. 109 West Torrance Blvd., Redondo Beach. Call (310) 376-3550 or visit cancersupportredondobeach.org. Transforming your everyday photos into beautiful, meaningful art. Ry Sangalang, a fine art photographer, will present a program on photo compositing. He teaches at the Los Angeles Center of Photography and loves to help people amplify the creative part of their lives through this art form. The meeting is free and is open to anyone who is interested in photography. Torrance Airport Administration Building meeting room, 3301 Airport Drive, Torrance. For more information contact Harry Korn at (805)-340-3197 or visit sbccphoto.org. A special presentation by Lauren Spiglanin and Family Connect Care provides information about key risk factors for dementia and how to mitigate them. Learn about alternative, on-pharmacological, therapies that can help those with dementia, improve quality of life, and enhance care for your loved one. 6 – 7:30 p.m. Redondo Beach Library (upstairs conference room), 303 N. Pacific Coast Hwy., Redondo Beach. Free. Call (310) 383-1877 to register. Cancer Support Community Redondo Beach (CSCRB) will host comedian Jason Love. Laughter is the best medicine. Love and a few of his comedy colleagues will present an evening of family love, fun, and laughter. Love has appeared on numerous national television broadcasts including Comedy Central, HBO, and America’s Got Talent. Advance registration is required. 5:30 – 7:30 p.m. 109 West Torrance Blvd., Redondo Beach. Call (310) 376-3550 or visit cancersupportredondobeach.org. Baby Lapsit (0 to 18 months with caregiver). Babies 0-18 months and their caregivers join in a fun storytime full of songs, rhymes and fingerplays. 10:15 – 10:45 a.m. Main Library Storytime Room, 303 N. Pacific Coast Highway, Redondo Beach. Session is limited to 40 individuals on a first-come, first-served basis. Get your numbered passes in the lobby at 10 a.m. For more information on Library programs and services call (310) 318-0675, option 6 for Children’s Programs. For updated information visit redondo.org/library. Beach Cities Health District hosts informal walking groups to give parents an opportunity to connect with other parents on a range of topics. Groups are led by parent volunteers. No registration necessary. Free. 9 – 10 a.m. Aviation Park, 1935 Manhattan Beach Blvd., Redondo Beach. The South Coast Botanic Garden Community Open House and Ribbon Cutting. Learn about new garden happenings, including recent additions to our team. 3:30 p.m. 26300 Crenshaw Blvd., Palos Verdes Peninsula. RSVP by calling (424) 452-0937 or email yumiko@scbgf.org. Visit southcoastbotanicgarden.org. The South Bay Apple Mac Users Group monthly meeting. A group of 100 Mac, iPad, iPhone and Apple Watch aficionados. 6:30 p.m., Beginners Q & A, 8 p.m., presentation on the latest Mac operating system, Mojave. Lomita VFW Hall, 1865 Lomita Blvd., Lomita. Visit sbamug.com or call (310) 644-3315, email: info@sbamug.com. Admission is free. All Mac/iPad/iPhone users and potential users are welcome. West Basin Municipal Water District presents its Landscape Transformation event series running through March 2019. Learn how to take advantage of the Metropolitan Water District’s new Landscape Transformation Program. Metropolitan’s new rebate program offers guidelines for residents as well as commercial, industrial and institutional users to qualify to receive $1 for every square foot of grass they replace with more water-efficient native plants, irrigation systems and sustainable features. Various available rebates includes cash back for water-saving sprinkler nozzles, smart sprinkler controls and other devices. 6:30 – 8:30 p.m. Center Street Elementary School, 700 Center St., El Segundo. For questions or information call (310) 371-4633 or visit conservation.westbasin.org.